Safer Security at Schools | Blue Star Security "Chicago's Finest Protection"
Education Security requires an on-going proactive commitment, that’s where Blue Star Security stands alone. We provide the expertise and analysis necessary for a total protection plan. Blue Star’s team of experts provide multiple options of protection to those who are most vulnerable. Why wait for the unexpected tragedy, we can work with you to develop a comprehensive safety plan. 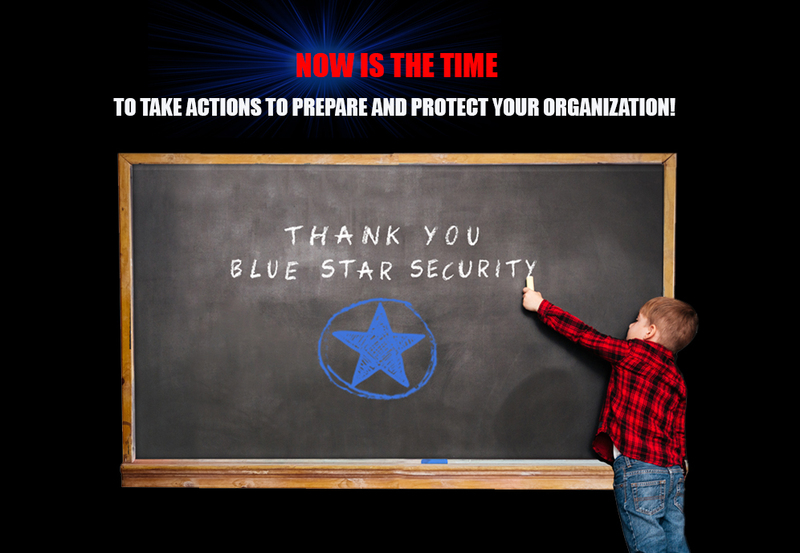 Blue Star Security, Ltd. provides schools and universities the highest quality trained security professionals, modern access control, emergency planning and specialized training that will create a more secure environment. pre-employment screening of faculty and staff are no longer optional. These are just some of many life safety solutions school administrators and educational institutions need to consider. You need to know what you need to do in order to reduce risk. This requires education and a willingness to recognize existing vulnerabilities along with a commitment to a multi-layered strategy in order to provide protection for any type of security emergency. Our team can shift your response from reactive to proactive and increase the potential of saving lives. Established evacuation procedures, security patrols, permanent armed guards, better understanding of local and national trends in school violence, managing and accessing student threats, and working with the media are just some of the elements of a well-organized school safety program. Blue Star Security Ltd. education emergency planning services can help your school or university evaluate your current life safety standards and make recommendations on how to improve response and recovery. We can assist you with developing crisis response plans, establishing crisis response teams, designing access control solutions, draft your school safety training protocol and table top exercises and refine communication both in and outside of the school facility. The Blue Star Team can shift your response from reactive to proactive, this approach increases the potential of saving as many lives as possible!